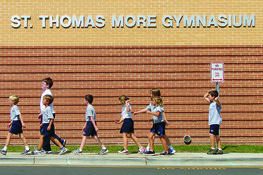 Please enjoy a brief history of St. Thomas More Catholic School. The Lewis Award is an honor designed to recognize, promote and encourage excellence in teaching in the Catholic Schools in the Diocese of Raleigh. Nominations are submitted by individuals, groups, schools and parishes for classroom teachers deemed exceptionally skillful and dedicated and who possess the respect and admiration of their students, parents and colleagues. If you would like more information or nominate a teacher for the 2018-19 award please visit the Lewis Award website. Marilyn Stuit - 5th grade teacher was recognized for the 2016 "Excellence in Teaching" award by the diocesan Lewis Award committee! Michelle Silva - Kindergarten teacher was recognized for the 2005 "Excellence in Teaching" award by the diocesan Lewis Award committee! Marilyn Misa - 3rd grade teacher was recognized for the 2001 "Excellence in Teaching" award by the diocesan Lewis Award committee!